On the hillside of Yangmingshan mountain sits a single house with a blue-glaze tiled roof, whitewashed walls and Spanish spiral pillars, surrounded by a greenery-filled yard. This is the former residence of famous early-20th century writer Lin Yutang. 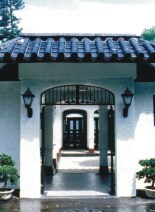 When entering through the Western-style archway, what comes into view is an elegant open-sky courtyard. In one corner, there is a small fishpond surrounded with green bamboo, sweet gum plants and Chinese wisteria. It is here that Dr. Lin enjoyed watching the fish with a fishing rod in hand. The rooms in the house open up to each other in typical Chinese style. The home's former dining/living room is today known as the "You Bu Wei Zhai" salon and is a good place for visitors to enjoy a meal or glass of tea. The long balcony was where Dr. Lin usually could be found wandering around. He once wrote, "At dusk after dinner, having finished work, eating pieces of watermelon, I sit on the balcony and relax in this cool place by myself, with a pipe held with my mouth, sometimes having smoke, sometimes not. Watching the front hill slowly sinking in the vagueness of dim night, the lamplights shining down at Tienmu, and cool breezes gently blowing, I am sometimes thinking about something, but sometimes not. What a fortunate man I am!" During the day, you can enjoy a clear view of the sky and take in the distant Tamshui River. At night, you can likewise gaze at the moon and night scenes. At dusk, there are scenes of Mt. Guanyin and the glimmering setting sun. All this is a reflection of Dr. Lin's cozy, tranquil attitude towards life. 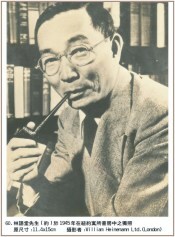 Dr. Lin advocated humorous literature and gained the title of Chinese "Master of Humor". "A speech should be like a woman's skirt--the shorter the better." This witty remark, which makes people smile, is by Dr. Lin. His work and experiences stretched over over Eastern and Western cultures, as he earned academic degrees from Shanghai's St. John's University, Harvard University and University of Leipzig. He wrote in both Chinese and English throughout his life, and is famous for "The Life and Times of Su Tunpo", "Moment in Peking", "The Importance of Living", "A Leaf in the Storm", "The Vermilion Gate", "The Wisdom of Lao Tse", and other works. Among them, his work "My Country and My People" really was a great hit when released in the U.S. in 1935. Dr. Lin contributed greatly towards introducing the spirit of Chinese culture to the West. Besides his reputation as a linguist, philosopher, literary man and traveler, Dr. Lin was also an inventor. From the small originality of device to help squeeze toothpaste to the big invention of a "fast typewriter", plus an indexing system for the lower and upper shapes of Chinese characters, specially designed for a typewriter. This system was the forerunner of the modern Chinese input methods, and is exhibited in a glass display case by the wall. Other belongings of Dr. Lin, including manuscripts, letters, books, a desk, glasses, pipes and clothing, are completely preserved. Leaving the uproar of city and admiring Dr. Lin's house and his great deeds makes for an enjoyable, worthwhile visit. YongFu stop. Parking is available in the car park situated diagonally across from the house.